I ditched the 7-ounces of chopped "best quality" chocolate because all I have are chocolate chips and the idea of chunks in my molasses cookies didn't sound very appetizing. I increased the amount of cocoa powder substantially. I like a chocolate-y cookie. I skipped all the steps that required refrigeration because I don't really have time for that. Here's the recipe with my changes. Martha Stewart doesn't believe in eggs in cookies. (Ok, I don't know that for a fact, but this recipe is very eggless, which I guess is good for making it vegan if you cut out the butter.) I was very wary of no eggs, but I went for it; I committed and I was surprised. Start by creaming together your butter and brown sugar. Dissolve your baking soda in water and then add to the butter and brown sugar along with ginger, cinnamon, cloves, and nutmeg. Let get happy in the mixing bowl. Then add 1/2 cup of flour and your 3 tablespoons of cocoa. Add your molasses, then your last cup of flour. Let combine until it's formed a dough. It will be kind of soft and goopy, but will hold a ball -- if you need to add more flour, do so 1 tablespoon at a time. Preheat your oven to 325 degrees. Line two baking sheets with parchment paper (or spray with nonstick spray if that's your thing). Use a 1-inch cookie scoop. If you don't have a cookie scoop, reassess your life and then go to Target and buy one; they're only like $5 and it makes it so easy to scoop cookies. Trust me, you'll thank me. Scoop your cookie dough and using your hands, roll into a perfect ball. Then roll in your 1/4 cup of regular sugar. Place on a baking tray about 1 1/2 inches apart. Bake one sheet at a time for 15-16 minutes. Remove from the oven and let cool two minutes, then transfer to a wire rack (or just let cool on the cookie sheet -- it's your choice). This recipe only made about 1 1/2 dozen cookies for me. After I ate my obligatory three cookies (1 was a test, 1 was to ensure the first test was good, and 1 was just for fun) and Danny ate two, we had about a dozen cookies. Martha's recipe originally said it made two dozen cookies using a 2-inch ice cream scoop. Um, excuse me, Martha, those are huge freaking cookies and you are a liar. Basically: you're going to get anywhere between 1-2 dozen cookies from this, depending on how big you make them. The results? They taste amazing. And they're chewy! They're moist, delicious, and chewy and basically perfect. This is a recipe that will stick around for a while, especially around the holidays. 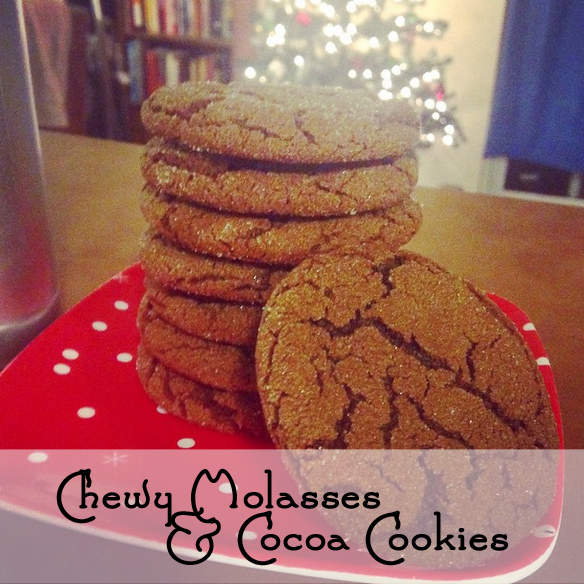 If you like molasses and cocoa, definitely try them. They're spicy, not-too-sweet, and delicious dipped into chai tea.